CADE is eager to hear from you to help shape our programs and meet your needs, as well as to collect data that will help advance the interests of agribusinesses. Please consider filling out our surveys. We’ll be sure to share the results with you (while keeping your responses confidential)! Calling all beef producers! Beef production is an increasingly important part of our region’s agriculture. If you are currently raising beef, CADE would like to know a little more about your business. This survey can be found here and should only take about 3 minutes. We’ll report back on interesting trends we observe in our next Two Way Report. Calling all vegetable producers! Field Goods invites vegetable farmers to fill out this survey, inviting you to score produce for 8 inputs based on "normal" weather conditions. Field Goods will compile results and use them to help educate communities, schools, and libraries about how different crops use varying degrees of resources. They will create an Earth Day quiz for kids, for example, asking questions like “guess which 3 vegetables need the most water to grow?” and so on. According to Donna Williams, President of Field Goods, “we believe that education about agriculture is important to increase communities’ support and appreciation for farming”. Results will be anonymous. There is quite a bit of enthusiasm about the potential for hemp as a viable crop, and some growers have plans to grow quite a bit of it. But there is still a fair amount of confusion about the regulatory environment, both in terms of production and in terms of sales, especially of edible CBD products (see this recent New York Times story). There is concern that regulations may still stand in the way of the development of this new market. There also remain significant questions to be answered about the agronomic challenges and the efficiency of harvesting the crop with existing farm equipment. CADE is excited to share the impact of our work on you. 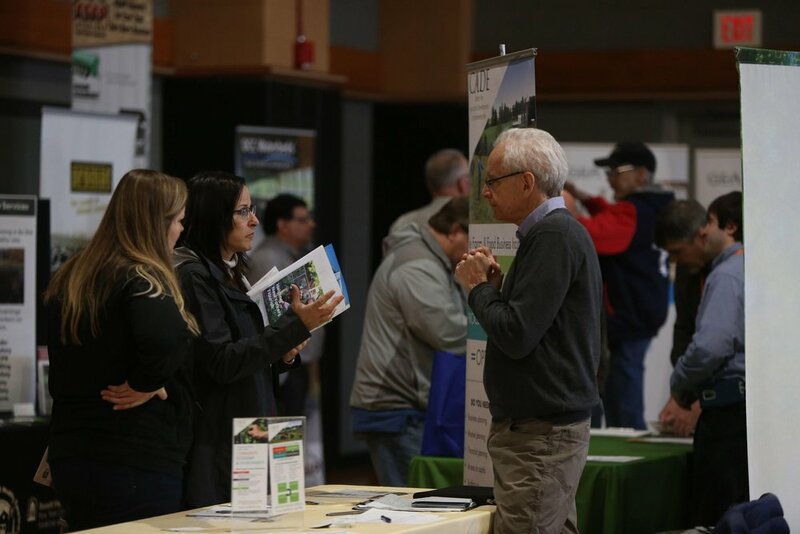 On March 14th, CADE staff tabled at the Ag Solutions Expo at SUNY Cobleskill and were inspired by the steady stream of farm and food business people stopping by our booth. We are now following up with each of those we talked to, helping them access information and resources to take the next step on their entrepreneurial paths. We particularly enjoyed having four of our Farm and Food Business Incubator program participants practice delivering their business pitches to a panel of peers and two impressive SUNY Cobleskill Ag Business Management students - Tom Coene, a senior, and Lydia Williams, a junior, who provided helpful feedback and support. Participating farmer Edmund Brown of Cairncrest Farm in West Winfield noted afterward: “Preparing for and then delivering my speech was a useful exercise - it brought home how far our farm business has come in the last four years, while at the same time it reinforced how much more we still need to grow.” Shannon Finn of Cowbella LLC in Jefferson agreed: “"Participating in the practice pitch session that was part of CADE's small business training workshop was a great experience that helped to hone and focus the message about our company that we want to be able to get across to potential investors." If you have a story on how you’ve been touched by CADE’s programs, we’d love to hear about it. Please let us know about it and we will include it in our future communications. Our Farm and Food Business Incubator 2019 winter workshop series has successfully concluded, with 38 attendees overall learning from CADE staff and specialist experts in the many components of developing a successful business plan. Over the coming weeks we will be finding more opportunities to do additional group classes, including rescheduling a couple of planned sessions that were canceled due to weather conditions. In the meantime, CADE will continue to work one-on-one with a number of farm and food businesses in an advising/mentoring capacity throughout the year. To learn more about accessing one-on-one support for your business needs, please see more information on our website here and complete our incubator application form here. In 2018, CADE launched its Fiscal Sponsorship Program and continues to welcome applications from farm and food businesses. The Fiscal Sponsorship Program offers a new opportunity for agribusinesses to identify and bring in new sources of capital. Businesses fiscally sponsored by CADE can request funding from organizations or individuals that require non-profit status. That means foundations can award grants to farm and food businesses--normally reserved for non-profit, or 501c3 organizations--and individuals interested in funding projects or donating to farm and food businesses enrolled in this program, may receive a tax exemption letter for their donation. See our website for more information and how to apply. Resources and inspiration for female farmers. A guide to pursuing a culinary-related career inside and outside of the kitchen. Useful websites and software for farmers. Farmwork training and general reference manuals. Wholesale Market Watch is a listserve that provides resources to connect small and mid-sized farmers in NY and the Northeast to larger markets such as food hubs, grocery stores, restaurants, online marketplaces and cooperatives. Producers interested in learning more about how to become New York State Grown & Certified and how to qualify can contact the NYS Department of Agriculture and Markets at 1-800-554-4501, email NYSGrownAndCertified@agriculture.ny.gov, or fill out the form here. Veteran resources for farm employers and those interested in farming. If you're considering a crowd funding campaign but don't know where to start, contact us. The Economics of Local Food Systems: A Toolkit to Guide Community Discussions, Assessments and Choices: The goal of this Toolkit is to guide and enhance the capacity of local organizations to make more deliberate and credible measurements of local and regional economic activity. "Beyond Beauty: The Opportunities and Challenges of Cosmetically Imperfect Produce"
Dairy: Milk is New York State’s leading agricultural product. Locally made value-added products like cheese, butter, yogurt and even gelato can be found throughout the state.